Although you may see a variety of packages in the supermarket, majority of the milk products are whole milk pasteurized and homogenized (meaning no cream on the top!) which come from different regions of Japan. 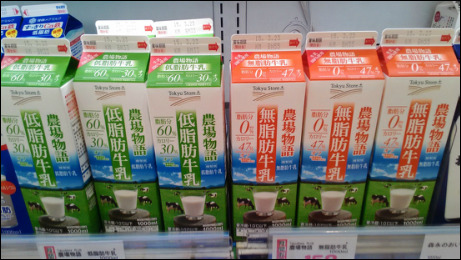 Nyuinryo(乳飲料）- Milk beverage - Other non-dairy products have been added. 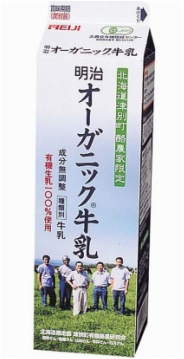 The price on the package may vary from 170 yen per liter to 500 yen per liter. Price difference comes from how they were pasteurized or whether they have been mass produced and blended or if they come from one farm. 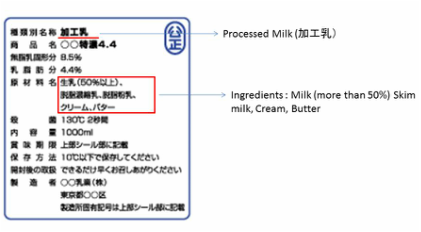 Organic milk（有機）in Japan is not so common and they may be hard to come by and usually costs more than double of non-organic mass produced milk. You can easily tell what the milk is by looking at it's package. 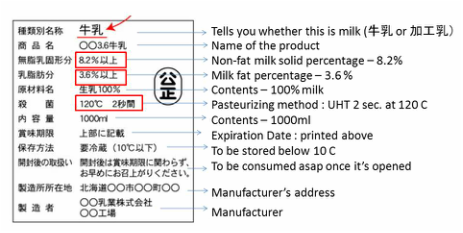 I﻿f you want whole milk, Look out for the word "牛乳” and avoid "加工乳"（Processed Milk) or "乳飲料"(Milk Beverage)　The numbers you may see on the carton such as 3.6, 3.7, 4.1 are the percentage of the fat content. Another way to tell whether it is whole milk or not is the indentation on the top of the package. This dent is made for the visually impaired persons to tell that it is whole milk and not other milk type drinks of the same carton. Although it is not popular, you can also get delivery from the milkman in your neighborhood. You need to call the operator and they will contact the nearest milkman to your home. They will bring you the catalog and you can choose what you would like to have delivered. 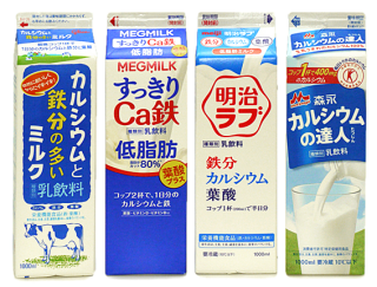 The product line up is different from the supermarket and they focus on functional milk in small glass bottles, but they still carry the whole milk in 1 liter cartons too. They will charge a premium for them and when I used to have milk delivered from Meiji, it was about 250 yen per liter and they delivered twice a week. 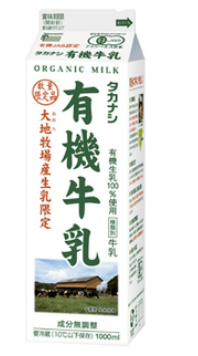 My mother in Hokkaido has a liter of glass bottle delivered from Meg milk twice a week and I think it was about 380 yen per bottle. The Kanji "北海道"means they are from Hokkaido. 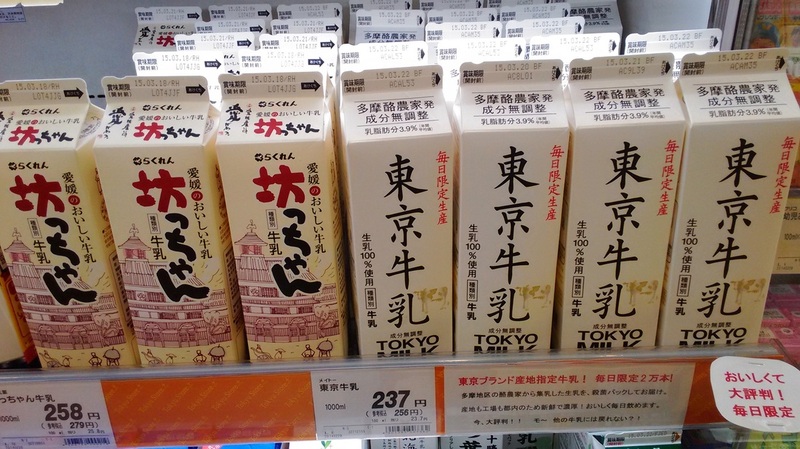 These milk are from single farms, The left from Ehime Prefecture in Shikoku. The right is from a farm in Tokyo. 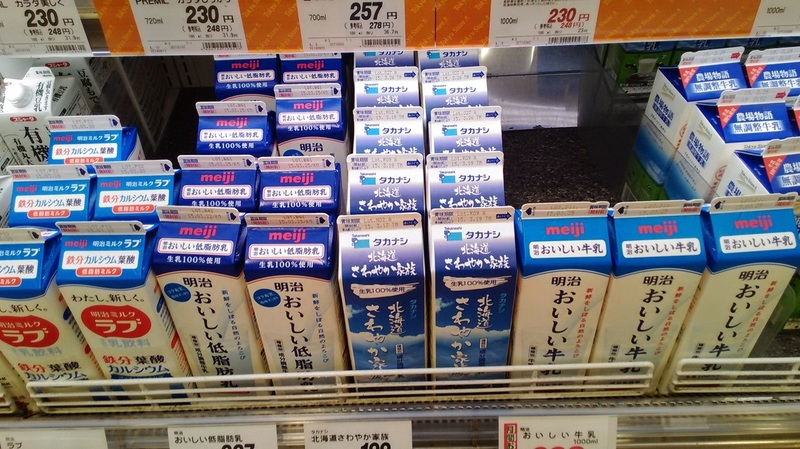 Since the Fukushima incident, majority of the supermarkets carry milk from the west region. 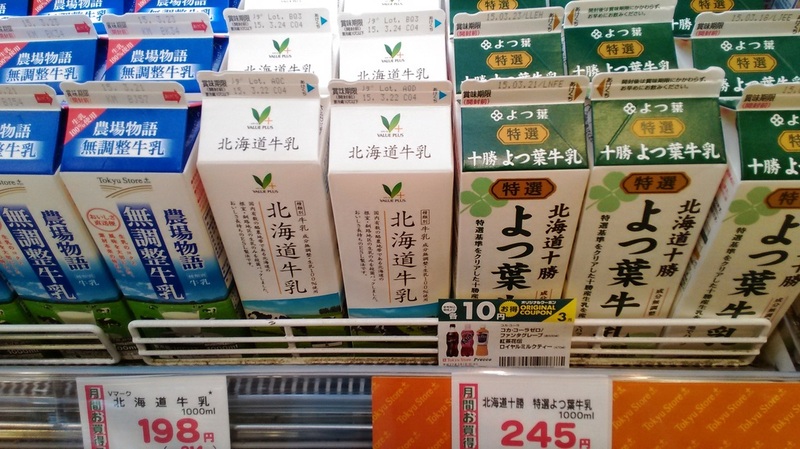 These are Nyuuinryo (乳飲料）- milk beverages, fortified with calcium and iron, low in fat.